1. 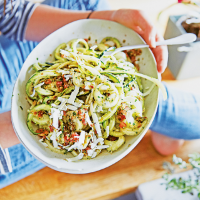 Using a spiralizer, make long strips – ‘courgetti’ – with the courgettes. Heat the oil in a large frying pan and toss the courgette strips in it for a minute. Season well and transfer to a large bowl. 3. Toss the courgette strips with the pesto and top with the grated ricotta salata.